Baseball legend, Frank Robinson, is a baseball legend, especially in Baltimore. 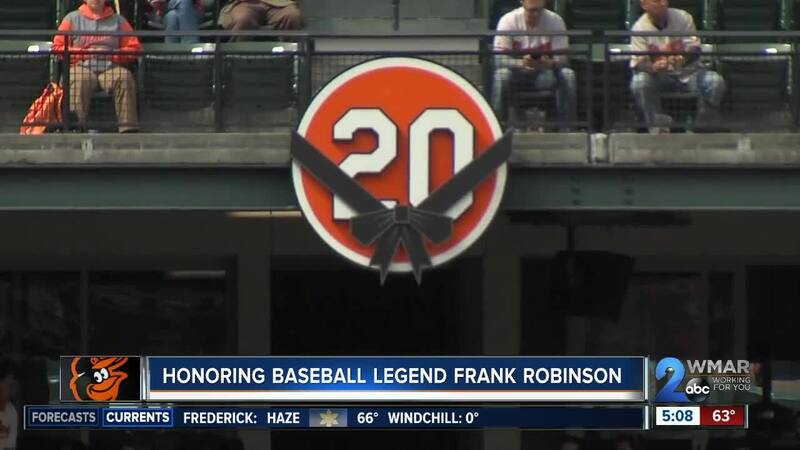 Right before the Oriole's home opener, Robinson was removed and honored for his civil rights work after he passed away in February 2019. BALTIMORE, Md. (WMAR) — Orange and black everywhere you look for the Oriole's home opener on Thursday. The excitement continued to build as fans filled the seats. However, for a few moments, the stadium went silent. A break from the noise to honor one of the greats, Frank Robinson. Robinson passed in February of this year at 83-years-old. He left a huge legacy in the baseball world, especially in Baltimore leading his team to four worls series in six years. After his time on the field, he went to the sideline. He became a coach and the first African American manager. Right before the first pitch on Thursday for the Orioles' opening day, Robinson was recognized for his civil rights. Jackie Copeland, the Executive Director for the Reginald F. Lewis Museum, accepted the award on his behalf.